Sometimes giving a gift is more fun than receiving one. This is even more true when your girlfriend is touched by an unexpected romantic gesture. If you're giving jewelry to your sweetheart and you want to indulge in the presentation, there are several ways to spice it up without sticking to the typical store-wrapped package. You'll earn points with your significant other by putting in the extra effort. If you're planning to go out to dinner with your loved one and think that would be an appropriate time to give your gift, present it as a part of the meal. At the restaurant, bring out the jewelry wrapped in a small box under a covered dish so she has to remove the lid. 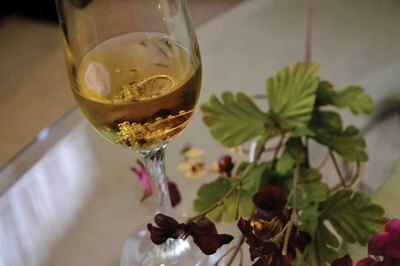 Place an engagement ring at the bottom of a champagne glass or as a decoration on a piece of cake. Keep an eye on her so that she doesn't eat or drink the shiny new jewel. Another option if you're proposing is to write "Will You Marry Me?" on a plate at a pottery shop and have the ring presented on it. Having a stuffed toy wear the jewelry is a sweet gesture, especially for an animal lover. A necklace, earrings or bracelet can be placed right on the toy; a ring can be placed over an arm or on a string as a necklace. Take the romantic gesture one step farther by placing the animal on your sweetheart's chair as a surprise while she's in the restroom -- if the animal is large enough that she'll spot it before sitting down. Surprise your significant other with your jeweled gift by camouflaging it in an every-day item around the house. 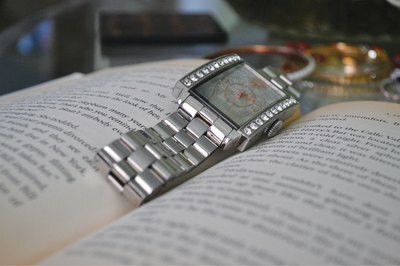 Make a bookmark out of a watch and place it in something he's currently reading. If you're giving jewelry at Christmastime, secure it inside a plain glass ornament and hang it on the tree, or use an ornament hook to hang the jewelry on a spot near the front of the tree where he will see it. Let your partner share in her glee about your gift by having it brought to the office. Order a favorite bouquet of flowers and ask to have the jewelry included in it as part of the delivery. 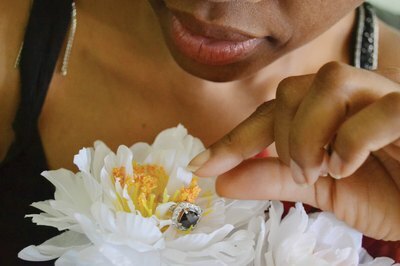 Attach the piece to a flower or use it as an adornment to the vase. If it's a significant gift, such an engagement ring, follow up the delivery in person to pop the question. For a simple and romantic way to give jewelry, write your heartfelt notes in a card and place the piece of jewelry inside. This method works best with flat necklaces, bracelets and earrings. If you're good at writing poetry, write a poem. If not, copying a love poem or listing why you love your sweetheart are other romantic ways to show love.